First it was a 1992 book by (the late) Robert James Waller, then a 1995 Clint Eastwood-helmed film starring Eastwood and Meryl Streep. 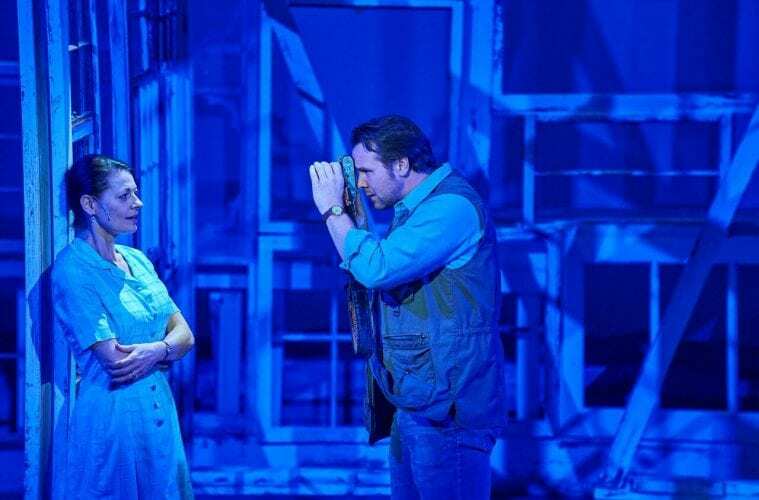 The latest incarnation of the romantic The Bridges of Madison County is a stage musical hindered by its scope but helped tremendously by its score and its complex central character. 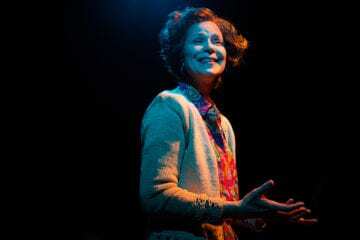 Aurora Theatre’s version, a Southeastern premiere running through April 16, can’t conceal the frailties in the material but does offer some exceptional leading performances. Its music and lyrics are by Jason Robert Brown — who similarly explored a short-term relationship with his beloved The Last Five Years — and its book is by Marsha Norman (‘night, Mother and The Color Purple), who has made some significant changes from the film, most notably the fact that the characters here are much younger. Francesca Johnson (Kristin Markiton) is an Italian war bride who has been living in Iowa with her husband Bud (Matt Lewis) for almost two decades. Despite dreams of her own, she now finds herself trapped in a marriage where she has become a homemaker. When Bud takes his son Michael (Benjamin Davis) and daughter Carolyn (Hannah Church) to the 1965 state fair, Francesca is left alone at home. One afternoon, she is interrupted by a knock on her door by Robert Kincaid (Travis Smith), a photographer who has been commissioned to take photos of local bridges for National Geographic. He asks for directions and she obliges, and over the next few days a friendship develops, then more so. The two fall for each other, and Robert asks Francesca to run away with him. In an age with precious few original musicals, The Bridges of Madison County is the latest film-to-musical transfer, and this one was a high-profile Broadway disappointment, opening in early 2014 and closing less than three months later, in the shadow of more lauded work. Writer Norman wants to make Iowa a character of its own and flesh out the supporting characters as well, including the husband, children and a nosy neighbor couple, Marge (Valerie Payton) and Charlie (Rob Cleveland). Bud here isn’t as nondescript as he was in the movie, although a sudden bout of violence at the end is jarring and ill-conceived. Norman and Brown are adamant, too, about giving everyone a song of their own. And although the score is impressive and deep — the show did win a deserved Best Original Score Tony — it can be inconsistent. Two numbers are sung by supporting characters while Francesca and Robert interact in her living room and kitchen, almost in the background. Marian (Rhyn McLemore Saver), a former love interest of Robert, sings the folksy “Another Life,” while Marge anchors “Get Closer.” The numbers are each fine but a little outside of the central relationship. A splashy song that opens Act II, “State Road 21,” likewise feels extraneous, a blatant attempt at a crowd-pleasing moment, while Bud has two numbers that don’t add much. Had this been a two-person show and concentrated solely on Francesca and Robert, the musical would have cut deeper. The most memorable numbers — and there are some lovely ones — chart the swirling emotional tug the two lovers feel. Ann-Carol Pence’s music direction and the 10-person band expertly handle the loaded 19-song score. What’s arguably most memorable about the film — outside of Meryl Streep — is the classic, excruciatingly suspenseful will-she-or-won’t-she sequence as Francesca mulls her future. Sadly, that moment is not in the musical, and it seems like a missed opportunity. The ending here is a bit clunky, but the final two numbers are so powerfully staged by director Justin Anderson that it makes up for the long-winded finale. Anderson has cast this production with precision, especially his two central characters. With notable turns in Aurora’s Memphis and Theatrical Outfit’s Big Fish behind him, Smith has become the go-to performer for local musicals, and he brings his considerable range to Robert. It’s a role that is considerably less developed than Francesca, but he does bring a sensitivity and need for connection to the closed-off character. In Markiton, Anderson has found an actress who can tap the emotions of the scene and scorch the heck out of a musical number as well. To say she connects with the material is an understatement. Her best non-singing moment comes as Robert snaps a picture of her. Shy and self-conscious at first, she’s nonetheless flattered, trying her best to contain her feelings. Smith and Markiton have some potent duets, but their closing solos, Robert’s “It All Fades Away” and Francesca’s “Always Better,” are showstoppers, full of melancholy and regret. Don’t be surprised to find yourself YouTubing each one days later. Narratively, The Bridges of Madison County can be cliched and sentimental at times, and overstuffed at others. With Smith and Markiton as its ill-fated lovers, however, The Bridges of Madison County is a lot more formidable than it has a right to be.